It is relatively easy to connect a RISC OS computer and an Apple Mac together so that you can transfer files back and forth between them. I have experience of networking both Mac OS 9 and Mac OS X machines together. However, these instructions assume you have upgraded to Mac OS X. If there is enough demand I may write an article explaining how to network Mac OS 9 to RISC OS, but Mac OS 9 is gradually being phased out, so I've decided to concentrate on OS X. These instructions assume that you are using Mac OS 10.4 (Tiger) but they should be fairly generic. However, if you have the latest version of OS X, then I've written some specific Leopard instructions. 4. Underneath the Location panel is another panel saying which settings are being shown. This will generally be IrDA Modem Port, Internal Modem or Built-in Ethernet (depending upon the hardware installed in your Mac). 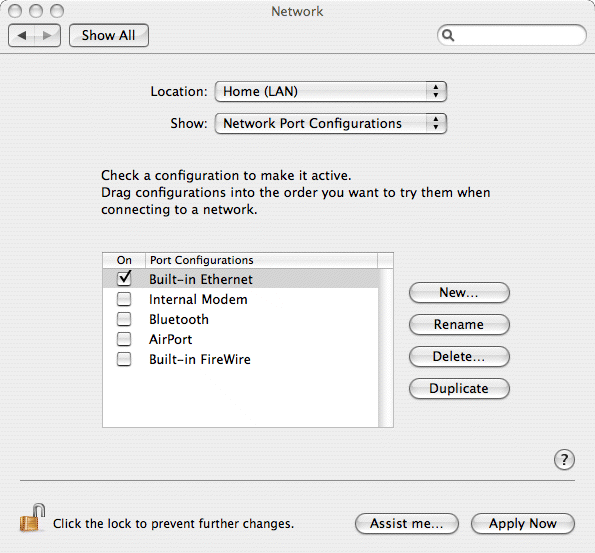 Click on the Show pull down menu and select the 'Network Port Configurations' option. 5. Each interface that is installed in your computer will have an on/off tickbox. Simply go through each one disabling ones that aren't used, or you don't with to configure in this location. You need to ensure that the Built-in Ethernet one is turned ON though (ticked). 7. Ensure the TCP/IP tag is selected (you don't need to worry about the other tabs at this point) and click on the Configure drop down menu. 8. Select the Manually option. 9. Now enter the IP address you require for your computer in the IP Address box. This should be something like 10.1.1.55 ensuring that the first three numbers are the same as those configured for your RISC OS computer. The fourth number should be unique within your network. 10. Enter 255.255.255.0 in the Subnet Mask box. 11. You can leave all the other boxes blank - unless you have a router or want to setup a more complex network - in which case they should be set to your ISPs name server values. 12. Click Apply Now to set the options and save for future use. At any point, these settings can be set, simply by selecting your relevant location from the Location submenu on the main Apple menu (very top left of the screen). Still in the System Preferences window, click on the Sharing icon and you should see a window containing three tags; Services, Firewall and Internet. Ensure the Services tag is selected. Within this tag you should see a service called FTP Access. Make sure this option is ticked, and it will enable other computers to connect via FTP. Leave the Path blank, and enter a Mac OS X username into the User box. You should now be able to click 'Connect' and if all is well, a window will open containing the Home directory of the Mac OS user you've just logged in as. 1. If you have OmniClient or LanMan, you can also connect to Apple Macs via 'file sharing'. Before you do this, you have to ensure that file sharing is enabled on the Mac. To check this, load the System Preferences and click on Sharing. Make sure Windows Sharing is enabled by ticking the option. This will set the relevant firewall rules on the Mac and enable the file share server. Once you've configured the Mac you're ready to start the connection from the RISC OS machine. To do this you will require a copy of !OmniClient along with the LanMan module (supplied with newer versions of RISC OS). Load !Omni and click MENU over it's icon. 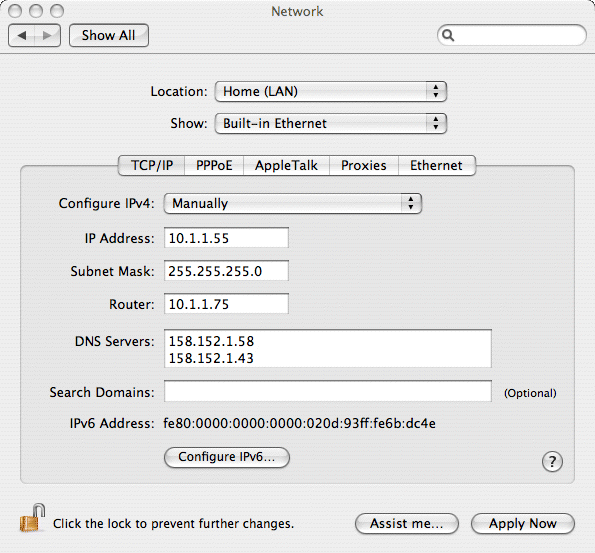 Navigate the menus to open the Mounts->Protocols->Lan Manager. 3. Enter the name you want to call this 'mount' - can be pretty much what you want and will identify the remote computer on your iconbar. 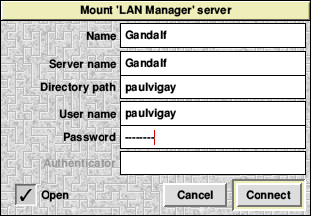 Call it Mac or in my case, Gandalf which is the network name of my Mac. 4. Enter the Server name which should be the name of your remote computer. This is shown in the Apple Sharing configuration window (see above). 5. Enter the Directory path which should be the name of the user you want to connect to on the Mac. If you're unsure, to to the System Configuration on the Mac and examine the System - Accounts settings. 6. Enter the User name which should be the name of the user you want to connect to on the Mac. Generally, this will be the same as the directory path unless you've modified the directory path to connect to a sub-directory on the Mac. 7. Lastly, enter the Password which is the relevant user password on the Mac. 8. Click Connect and if all is well you should get a shared disc icon appear on the iconbar after a few seconds. Clicking on the shared disc icon should open a standard looking filer window containing all the files on the remote (Apple Mac) computer and you can copy files in the normal RISC OS drag 'n' drop manner.